Captives is slightly larger in size than Paul Wilson’s ‘miniature’, The Little Book of Calm – however, if you’re looking for anything calm in these 112 pages, you’re going to be sorely disappointed. The Little Book of Unheimlich would have made a fitting subtitle for Meyer’s collection of 37 captivating microfictions – short works of anything between a single paragraph and a few pages, each bound together by a shared sense of deep disquietude. 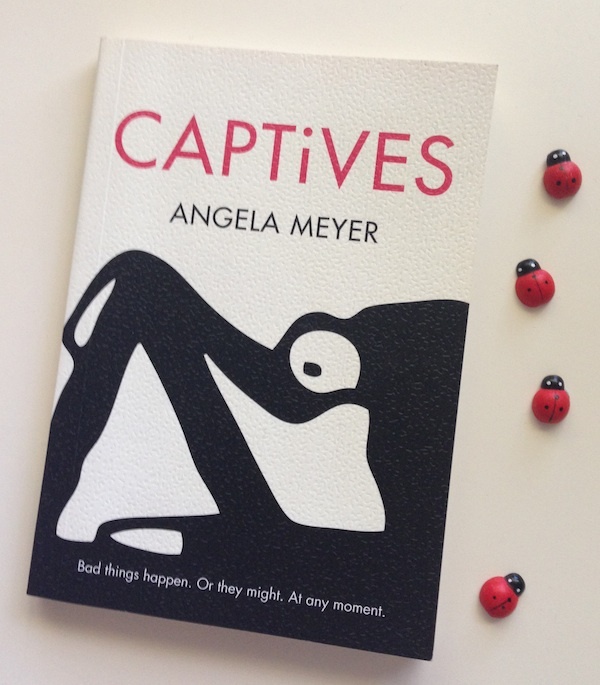 Scuttle over to Newtown Review of Books and read the rest of my review of Angela Meyer’s Captives – a deceptively cute little book about dark, dark things. More? But of course. Here’s an interview with Angela Meyer by Daniel Young from Tincture Journal about the publication of Captives – as well as writing in a more general sense. 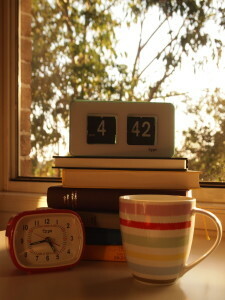 It’s Past, Present and Future time again. Every two weeks, I invite someone bookish to come time travelling with me, asking them to tell me a little bit about the book they’ve just read, the book they’re reading right now, and the book they’re planning to read next. Hence the name – past, present and future. This fortnight’s guest is none other than Elizabeth Lhuede. 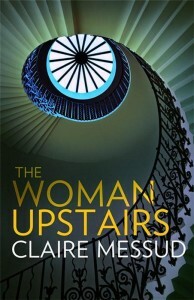 She’s the founder of the Australian Women Writers Challenge – as well as a soon-to-be novelist. 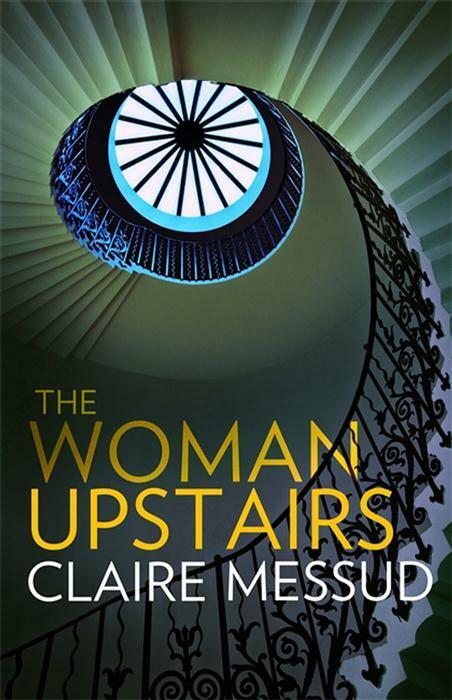 In the last couple of weeks, I’ve devoured three books that have been sitting on my e-reader for ages, each by Australian women. It’s a sure sign that I’m procrastinating with my writing. I’ve hit that point in my novel where I can’t bear to look at it, let alone work out what’s wrong and decide how to fix it. 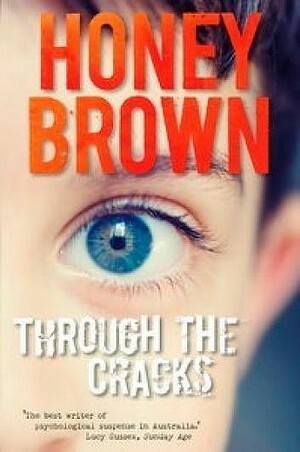 Luckily, I’ve found some of Australia’s most talented women suspense writers to ease the pain. 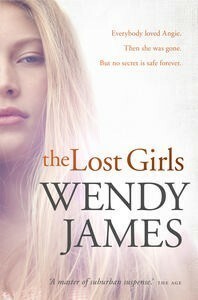 The books I’ve just finished reading and reviewing are all 2014 releases, Honey Brown’s Through the Cracks, Wendy James’ Lost Girls and Dawn Barker’s Let Her Go which is just about to hit the bookshops. It was only because of my determination to finish my draft that I didn’t get to the first two sooner, as I’m already a fan of each of these writers’ work. I loved Brown’s Red Queen and Dark Horse, was riveted by James’ The Mistake and Barker’s debut novel Fractured was one of my top reads for 2013. These latest books are equally compelling. What I particularly like about these authors’ books is that each reflects aspects of Australian culture that I recognise. They create suspense by depicting the extraordinary out of the ordinary, portraying dramatic events experienced by characters whose lives are suburban and familiar, and who speak in idioms I hear around me. As a reader, I’m enthralled. As a writer, I admire their techniques and try to employ them in my own work. As a blogger, I enjoy comparing my responses with those of like-minded readers, particularly those whom I’ve met through the Australian Women Writers Challenge. 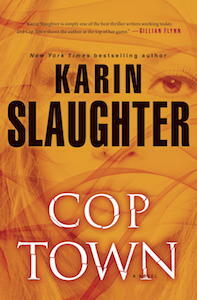 Currently, I’m reading Cop Town by best-selling US writer Karin Slaughter. 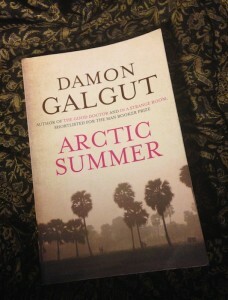 It’s not my usual thing as, although I’m a suspense and thriller fan, I prefer up-to-the-minute novels set in Australia, the UK and Scandinavia. Cop Town is set in Atlanta, Georgia, in the 1970s, a hell-hole of bigotry, racism, misogyny, homophobia, religious sectarianism and class suspicion. At times the graphic violence in this novel, especially violence by and towards women, has me wanting to throw the book against the wall (which I would, if I weren’t reading it on my iPad). 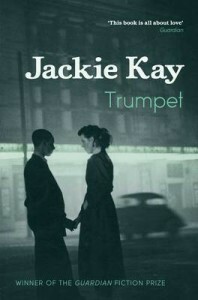 What I appreciate about the novel isn’t its serial killer motif (which I find problematic), it’s the sociological portrayal of a power structure on the wane; a white, patriarchal hegemony which centres around a police department in Atlanta, but which is emblematic of US society in the 1970s. Such a sociological perspective involving police work is one which P M Newton portrays in The Old School, set in Sydney in the early 1990s, the difference being that Newton’s book is a lot better written. While I really should finish writing my book before I grab another novel off the shelves, I have a huge “to be read” pile to choose from. On offer are: Clare Wright’s Stella Prize winning history, The Forgotten Rebels of Eureka; Kate Forsyth’s The Wild Girl (though I’m even more attracted to the title of her latest, Dancing on Knives); Kate Belle’s Being Jade; John Safran’s Murder in Mississippi; and a couple of shorter works, Sarah Drummond’s Salt Story, Angela Meyer’s The Great Unknown and Julie Proudfoot’s recently released novella The Neighbour. And that’s just in hard copy. My e-reader has even more. When Luke is implicated in the tragic death of a child, he struggles to assert his innocence to those around him. While the accident invokes haunting memories of Luke’s late brother, who died when they were children, he strives to maintain a grip on reality as his relationships begin to unravel. 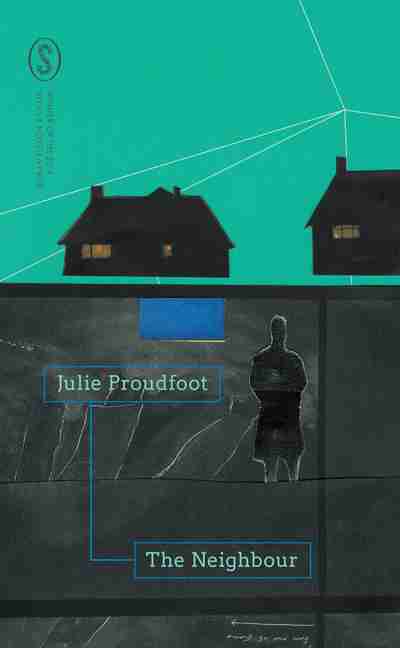 Set in contemporary suburbia, The Neighbour is an astute psychological drama that offers a powerful and literary meditation on the nature of guilt and responsibility. Acute psychological drama set in suburbia? That sounds like my kind of book. Thanks Michelle, for a wonderful blog and for the opportunity to share my love of reading. Elizabeth Lhuede recently had a novel accepted for publication by Escape Publishing. A romance with suspense elements, the novel will be published under her pen-name, Lizzy Chandler. Elizabeth is still hoping to be published in her favourite genre, psychological suspense. Her reviews can be found at her blog, Devoted Eclectic. In 2012 Elizabeth founded the Australian Women Writers challenge with the aim of helping to overcome gender (and genre) bias in the reviewing of books by Australian women. The challenge, now in its third year, is jointly run by a team of book bloggers. In January 2014, the AWW website earned well-deserved recognition by being selected for preservation by the Australian National Library’s archive, PANDORA. If anyone’s interested, it’s not too late to sign up to read and review for the challenge. (You can read more about it here.) Apart from being for a worthy cause, it’s a great way to meet other avid readers; aspiring, emerging and established authors; and book industry professionals. A worthy cause indeed. 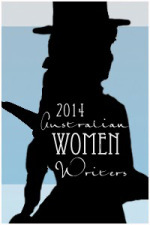 If you’re not aware of the Australian Women Writers Challenge, you really should take a look. Thank you Elizabeth – and good luck with your writing!